Necessary Acts. Peter Huggins. River City Publishing. Montgomery, Alabama. 2004. We've made a promise to our publishers that we will happily read all of the books of poetry they send our way regardless of when they were published. Although we do try to post blogs about recently published books first we believe all books of poetry are new until the reader opens them. 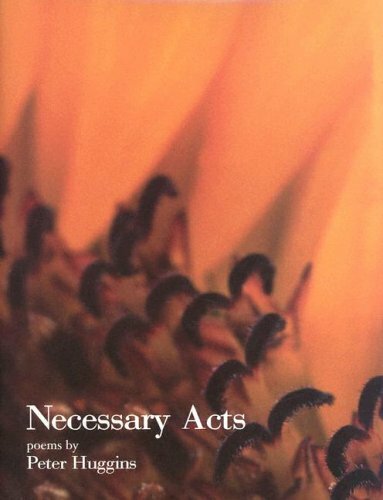 So today we're going to take a shot at Huggins third book of poems, 2004's Necessary Acts. Necessary Acts seemed a necessary inclusion. Huggins is one polished poet, we've become very fond of the way he works through a poem. These poems feel as fresh as new snow, clean too. Huggins writes with focused breadth. His poems free range from the deaths of little white rabbits to the unfortunate chain saw skills of grandfather and the readers feels that given time Huggins would artfully encompass the universe and render it in terms we could understand. Never at hand, was always out of reach. His chain saw, though, he found without trouble. And hickory he never touched or cut again. Today's book of poetry is convinced that Peter Huggins is building a poetry mansion and each of the poems from Blue Angels and Necessary Acts are a solid, beautiful and necessary stone, one after the other like a master mason. It's like Huggins is preparing meals for a poetry feast. If one succulent treat doesn't do the trick, turn the page, Necessary Acts will rumble out another Cordon Bleu plate. Necessary Acts was one of those books that Today's book of poetry wanted to slow down, read more slowly to get all that gravy. When it started to rain. Worked my chest like a pump. I guess I was dead. Try to shock me into life. Didn't want them to help me. I wanted them to leave me dead. Then I saw my body jump. Brought me back to life. Or what to do with my life. Today's morning read was a serious affair. All of our readers were on the same reverent page, they'd all read Blue Angels so they had a good idea of what was coming. Huggins aren't necessarily solemn but they sure do carry some weight. Necessary Acts is Huggins third book of poetry, his fifth and most recent books of poems is Audubon's Engraver (Solomon & George Publishers, 2015) and Today's book of poetry feels confident they are Huggins gold, he doesn't seem to mine anything else. Not with poison or guns or traps. Their aortas with stainless steel scissors. And the days' before. Repeatable, confirmed. Some days we used guinea pigs. And flicked their bodies against the sink. For life and for work and I'm grateful. 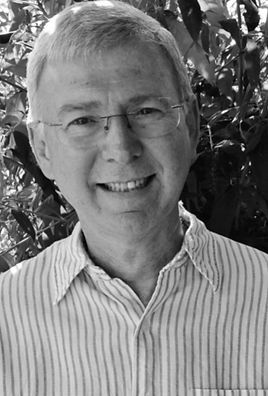 Peter Huggins is the author of five books of poems, Audubon's Engraver (Solomon & George Publishers, 2015), South (Solomon & George Publishers, 2013), Necessary Acts, Blue Angels, (both from River City Publishing, 2004 and 2001), and Hard Facts (Livingston Press, 1998). Audubon's Engraver was shortlisted in 2016 for the International Rubery Book Award, and South was shortlisted for that same award in 2014. He has published over 300 poems in many journals and magazines, and was awarded a literature fellowship in poetry from the Alabama State Council on the Arts in 2006. In the Company of Owls, a middle grade novel, appeared from NewSouth/Junebug Books in 2008. In addition, he has published a picture book, Trosclair and the Alligator (Star Bright Books, 2006), which has appeared on the PBS show Between the Lions, received a Mom's Choice Award, and been selected as a best book by the Bank Street College of Education and by the CCBC at the University of Wisconsin-Madison. He has recently retired from teaching in the English Department at Auburn University where he served for thirty-one years, and he and his wife live in Auburn, Alabama. "Necessary Acts is ripe with characters, from Dante to Sherlock Holmes to Elvis -- and ripe with poetical occasions, from a persona poem that converys the indignation of the animals Noah left behind to a narrative poem that recalls killing white rabbits at Tulane Medical School. Peter Huggins is unstoppable." "Peter Huggins is a rarity - a poet who writes with the clarity of a silver bell."